Tina Marie presented in October 2017 for adjunctive therapy to treat her chronic upper respiratory disease, hip and pelvic pain, and chronic renal failure. 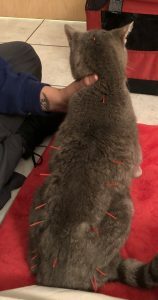 She received three acupuncture treatments that were separated by one week each, then every two weeks for two treatments, and is now on a once monthly maintenance regimen. Tina Marie’s respiratory disease is stable and improves after each treatment, and her most recent myofascial exams have shown her comfort to be improved as well. Tina Marie is a 14 year old, female spayed domestic shorthaired cat. She has a history of hyperthyroidism (diagnosed July 2017), chronic kidney disease (diagnosed December 2016), and chronic upper airway disease (nasal culture performed and patient treated with appropriate antibiotics on more than one occasion). An ovariohysterectomy was performed when Tina Marie was a kitten, and she has had no other known traumas. On October 27th, 2017, I examined Tina Marie for her first acupuncture treatment. 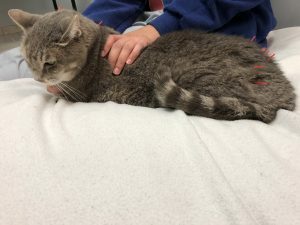 She had been treated with orbifloxacin antibiotic for about two weeks at this time for a flare up of her upper respiratory signs after a nasal culture. Tina Marie’s heart rate was 180, respiratory rate was 40, and her temperature was 101.4. She had bilateral mucoid/yellowish nasal discharge with referred upper airway noise, but her lungs were clear and her heart ausculted normally. Gait analysis: Tina Marie walked with a wide pelvic limb stance, and had thoracolumbar kyphosis. Neurologic exam was within normal limits. She had normal cranial nerve function, normal conscious proprioception of all four paws, normal patellar and cranial tibial reflexes, and normal biceps tendon reflexes. Myofascial examination showed myofascial restriction in the thoracolumbar junction, lumbar paraspinal muscles including the longissimus and iliocostalis over Tina Marie’s pelvis. Tina Marie was tender over both iliac wings and in her cranial gluteal muscles bilaterally. Her left quadriceps and hamstrings were ropey and tense, and her right hip was tender dorsally. Both triceps were ropey and tender but there were no obvious trigger points. Lab work was run October 24th, 2017, and showed a moderate-severe leukocytosis (29,400), moderate-severe neutrophilia (25,578), elevated symmetric dimethylarginine (SDMA) (23), elevated creatinine (2.0), and she was isosthenuric. Tina Marie’s main medical problems that I thought I could influence with acupuncture and laser therapy were suspected hip arthritis, chronic sinusitis, and chronic kidney disease. I started with homeostatic points to help reduce anxiety associated with treatment, and general anti-inflammatory points. I chose points that provided sympathetic regulation, thus constricting blood flow and opening up her nasal passages and airways, and local sinus and nasal points to reduce discomfort. I also chose points that stimulated blood flow to her kidneys, hopefully increasing her glomerular filtration rate and allowing for better renal function. Lastly, I directed stimulated blood flow and endogenous endorphin release to reduce pain in her stifles. Bilateral nasal discharge: I performed a nasal culture, which revealed infection with Staphylococcus scuiri and Pseudomonas aeruginosa, both sensitive to orbifloxacin. Elevated renal values: Since urine shows no signs of infection, patient has been treated with antibiotics for chronic rhinitis over a six week period, and her renal values haven’t significantly worsened over the past year, I’m very suspicious of chronic renal failure and have treated her as such. Abdominal ultrasound and renal biopsies have not been performed to confirm this diagnosis. Pelvic/pelvic limb pain, thoracolumbar pain, and triceps tenderness: Unfortunately diagnostic imaging was not performed to allow definitive diagnosis, but I am very suspicious of bilateral hip arthritis, causing secondary myofascial restriction and tenderness in the thoracolumbar paraspinal muscles and triceps. I performed primarily dry needling, with some adjunctive massage therapy once weekly for three treatments, followed by once monthly treatments. More recently, I’ve started adding in laser therapy as well, as I’m really trying to help stimulate blood flow to her kidneys. I used 0.16mm (red) Seirins for the whole treatment, primarily 30mm length, except where otherwise indicated. I chose governor vessel (GV)20, GV14, and BaiHui to provide a homeostatic effect. I used 15mm red seirins for large intestine (LI)20 to affect the infraorbital nerve, thereby reducing nasal stuffiness, and 15mm red seirins for LI4, which stimulated the radial nerve and the sympathetic nervous system. I also used 15mm red seirins for stomach (ST)36, which I chose for its anti-inflammatory and immune stimulation effects. I used 30mm red seirins for bladder (BL)18-23 (chosen as local points to reduce myofascial restriction in the thoracic and lumbar longissimus and iliocostalis muscles), BL52 (chosen to stimulate the thoracolumbar spinal nerves and blood flow to the kidneys), gallbladder (GB)25 (chosen to stimulate the caudal thoracic spinal nerves and improve blood flow to the kidneys), BL54 and GB30 (chosen to stimulate the sciatic nerve and reduce hip pain), and GB29 (chosen to stimulate the cranial gluteal nerve and reduce hip pain). For laser therapy, I used a Companion CTX-15, the large on-contact massage head. The laser treatment was centered over the kidneys, for a total time of one minute and forty seconds, 500 joules delivered. The power was five watts, continuous wave, and wavelength was 980/810 nm. Tina Marie responded favorably almost immediately to her treatment. Initially she wandered around the room, meowing from time to time and seeming somewhat agitated. After placing GV20, she curled up in my assistant’s lap, and laid there for the remainder of the treatment. The first time I placed a needle in BL54 on the right side, Tina Marie meowed and leapt out of my assistant’s lap—afterwards I was more careful to distract her when placing needles in this area and have not ever gotten that same reaction since then. At the end of the first treatment, Tina Marie sneezed a few times, expelling a large amount of yellowish nasal discharge, which led me to believe that I had been successful in stimulation of the trigeminal nerve. After the sneezing event, she breathed much more easily through both nares. The owner reported that this lasted for a day or so after the first treatment, but with increasing length after subsequent treatments. The owner also reported that Tina Marie seemed more willing to go up and down the stairs at home, and I found that after each treatment there was a reduction in the myofascial restriction in her thoracic and lumbar paraspinals and reduced hip pain. I attributed this to the hip points and bladder line points. I have repeated bloodwork, and found a mild decrease in renal enzymes and white blood cell count from the values in October. It’s possible that these are at least in part due to my attempts to stimulate her immune response with ST36, and renal blood flow improvement from BL23, BL52, GB25, and GV4.